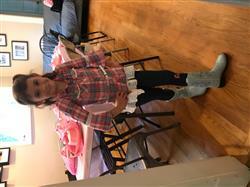 We bought these boots for my daughters 7th birthday and she absolutely loves them! She has been wearing them non-stop. They are comfortable, well designed, great quality and the price was so reasonable. I would definitely buy these in another color for her. I highly recommend these boots. My granddaughter absolutely loves her boots. She lives in them! Before she received the boots as a Christmas gift she wore only dresses. Now she wears jeans and tucks them into her boots. Thank you for a great product. Barb M.
Good quality, reasonably priced, and great fit. They're perfect.